Negotiations for the creation of the new Finnish government have been finalized after a month of hard bargaining and the new Prime Minister, Juha Sipilä, has announced the names of the new cabinet that will rule Finland for the next four years. Names like Olli Rehn, Anne Berner and Juha Rehula are enough to guarantee that this is not business as usual. The new Finnish government is all about hard-core austerity, help the rich - kill the poor, cuts and privatization but most importantly, true Finns policies with the alibi of a centre-right PM. But this is just the peak of the iceberg. This is what has reached the media, the reality is far more scary. And now it is governing Finland. And is not just governing Finland it has also become the face of Finland. A friend just returned to Finland from a visit to Brussels where she participated in an academic forum. Talking with colleagues she found out that where Finland was known as the country that champions transparency, education, youth care, tolerance; now is suddenly known as a xenophobic, homophobic, intolerant place that champions the darkest side of democracy. One thing that has really surprise me as an outsider is the denial of the reality the Finnish people show the last five years. A month ago and days before the general elections I heard exactly the same things I heard days before the 2011 general elections. There is no worry with the far-right, they will be somewhere around 4-5%. In 2011 they got 21.9% and in 2015 they are government, all wishful predictions failed. And you can see that if they keep their attitude and don’t compromise in their main issues like immigration and nationalism, in the next elections the True Finns will be replacing Sipilä in the PM’s seat. But what makes more interesting is the arguments. Leaving aside the fact that the situation reminds a lot of Germany and Von Papen’s deal with Hitler, with Sipilä strongly resampling the weak Von Papen; most of the Finns believe that the position of Timo Soini in the place of the foreign minister is a move where the state can control him and test him the same time. The Finnish constitution has something exceptional compared with most European constitutions, especially regarding the presidential powers. In Finland the president has the final word in foreign affairs and represents Finland in EU meetings and serious decision negotiations. That gives the impression of a foreign minister without any power, a puppet controlled by strings. A Soini under the leash controlled by President Sauli Niinisto. Wrong and misleading assumption to silence reactions. The Finnish foreign minister is not a puppet. The office has extended powers which also root in the cold war and the role of the president is advisory with the right to veto and not fundamental. The government plans and applies the foreign policy of the country. The president represents Finland in major EU meetings accompanied from the foreign minister but he’s not participating actively in negotiations and exchangers. As a policy the last forty years and especially since joining EU, the president and the government have never disagreed in foreign issues perhaps with only one exception, the Finnish possible candidacy to NATO. But all disagreements were limited the period when a possible candidacy was under talks. Apart from that, a public disagreement between the foreign minister and the president under current circumstances will mean one and only thing, elections. And if it is a case of principals with the True/Pure Finns standing firm to theirs the whole case will work for them and not for a presider that is already considered weak. For one month the three leaders have been negotiating not a program but the position of the True/Pure Finns in this new government. This demanded a lot of compromises from all sides but the True/Pure Finns made clear from the very beginning that there were certain red lines they are not willing to cross. Their victory had come due to these red lines and their future was depended on those red lines. While the other parties have the luxury to violate their campaign promises – the PM and the conservative minister of economics Alexander Stubb, have already started doing it by declaring that there will be cuts in education while they both had promised that there will be no cuts in education under any circumstances. The True/Pure Finns don’t have this luxury. And their priorities are clear: limited and controlled immigration, no more refuges, less EU, more nationalism. The fact that it is Sipilä the one with most compromises has already started showing. Finland is not going to increase the number of refugees the country takes, and that in a period when there is a big talk in the EU about the overwhelmed by refugees south Europe and how to help in the name of EU solidarity. Now when Great Britain or Germany even Luxembourg say that the refugees that that have entered their country is overwhelming it might make sense but it gets laughable when Finland talks about the number of refuges that enter the country annually. The last four years this number has been 700 a year which in the end were accepted with the refuges status less than a hundred per year, with the rest sent back to the countries they came from. Sometimes to a sure death. To give you an idea how pathetic that number is in our times and with so many front open all around the world, just think that neighbouring Sweden gives settler to nearly 2,000 refuges …a week. To accept refuges is a humanitarian act dictated by international agreements under United Nations guidance that Finland has participated and signed. But reading what True/Pure Finns stand for, you realize that humanitarianism is not one of them. 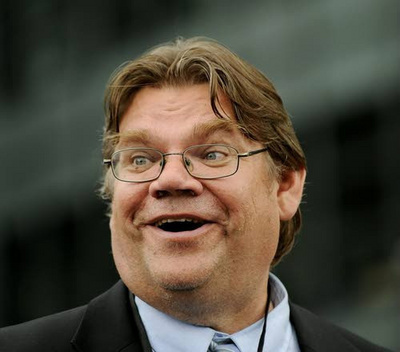 The next argument I dealt with was that Soini will never dare to do anything anti-democratic. Too late, he and his party have already done everything anti-democratic before even elected. Most of the hate crimes in Finland and all these you read above have been committed or said by members of the True/Pure Finns. Actually the True/Pure Finns is a party that insults the meaning of democracy. The thing is that till now Finns don’t want to accept it because – and this is the last argument I faced – as long the bread reaches the table …we are fine. I have answered to that before and I will only repeat it but it seems that most Finns haven’t understand the message yet. So now with the new face of Finland abroad what remains to see is if it this is the True face of Finland. Olli Rehn destroyed Greece with his austerity measures and brought the debt from 110% when the crisis started to 150% in 2010! Now this man is going to fix Finnish economics? And don’t forget his responsibility in the worst mistake EU has done since foundation, the expansion of 2004. A “businesswoman” with experience in decorating kitchens, part of a billionaire family business that takes a lot of state works and a relative with a private bank in Switzerland with only one customer - her company - and participant in a reality show is going to be the new minister of transport and communications? Responsible of the Finnish media. Of course she has experience of media, she publishes one magazine that goes periodically only to the customers of her company with photos of her luxurious house decorated by her. This is how transparent the new government will be! Indeed! Shakespeare thought that the whole world is a stage; but Federico Fellini thought of it as a circus of sort. He would have said: "Bring in the clowns!"